At JIVA InfoTech, we believe that Product Development involves a lot of ground work to define the product vision, product sustainability and ensure success. We bring distinct value with end-to-end Product Development lifecycle solutions. We have a powerful and unique combination of Technical and Functional experts. 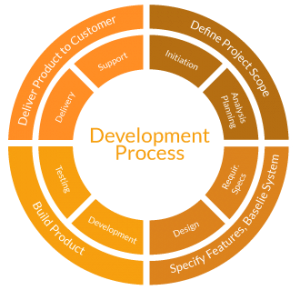 This combination holds the requisite proficiency and resources to take on entire Product Development projects. We also can expend to do required Research, prototype or develop the entire product. Outsourced Product Development at JIVA has its forte with the Customer centric processesThe Onsite-Offshore delivery model augments more client interaction for understanding the client requirements, effective implementation of the project and a judicious completion at cost-effectiveprice. We work with some of the world’s most innovative Software Vendors and Software-enabled businesses, varying from start-ups to established industry leaders.